Excerpted from "An Introductory Guide to Stratford's Natural Environs" published in 1990 by the Town of Stratford's Conservation Commission. Click here for a printer friendly version of this overview. 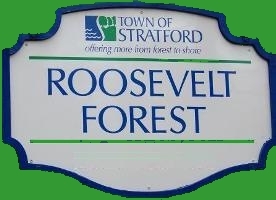 The Town of Stratford is very fortunate indeed to be one of the few towns or cities in the nation to have its very own forest. Located at the end of Peters Lane, off of James Farm Road, this beautiful 400 acre forest is part of our town's excellent park system. Roosevelt Forest was set up during the depression in the 1930's from land purchased by then Stratford Town Manager, Donald D. Sammis. It was developed in large part through PRESIDENT Franklin D. Roosevelt's W.P.A. program, designed to provide jobs for legitimate public projects. The park was established to provide recreational opportunities for townspeople, and to protect the watershed, wildlife and beauty of this fine example of mixed deciduous forest. Included in the forest system is a lovely pond, various wetlands, and for the user's benefit, there are playgrounds, picnic tables, picnic shelters, cooking pits, restrooms, walking paths and camp sites. Hiking, horseback riding, cross-countly skiing, snowshoeing and ice skating are all enjoyed here. The Stratford Junior Youth Conservation Club holds its activities in the WWII vintage Quonset Hut located here, as well as in another classroom building. The club is sponsored by the Town's Conservation Commission. Local Scout troops also utilize Roosevelt Forest for camping on a regular basis. The Police Department has an off-limits private shooting range here also. Without a doubt, the outstanding feature of the forest is its natural flora and fauna. Roosevelt Forest is a wildlife sanctuary and it has most species one would expect to find in a typical Connecticut mixed deciduous forest, including both coniferous, or needle-type trees (pines, spruces, ere.) and the deciduous broadleaf hardwoods (maples, oaks, etc.) Lovely trails, some marked, such as the RED TRIANGLE NATURE TRAIL (sponsored by the Stratford Conservation Commission), lead one to the wonders of nature. The above list is only a sampling; dozens of other species may easily be spotted. While extremely rare, even COPPERHEADS and MINK have historically been recorded here, and don't overlook the much more common poison-ivy! A walk through the woods, using common sense and preparation or if one prefers, a picnic with the family, can be gloriously enjoyed in ROOSEVELT FOREST, nature's wonderland.